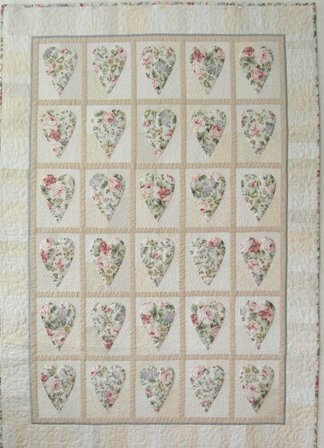 This Romantic Hearts Quilt has been one of the most popular quilting classes I teach, simply because it is so beautiful! In my sample, I have used a very soft floral for the "Hearts", one that was in my "stash". Using the same fabric for the binding pulls it all together. There are lots of wonderful fabrics available to use in this quilt. For example the Three Sisters or Robyn Pandolf lines would be perfect! Just make sure to keep the sashing low key so it doesn't overpower the print you use for your hearts. The hearts should be the focal point of the quilt. how to trapunto (puff up) the hearts the easy way. how to strip piece the backgrounds, as well as the piano key border. You will also learn the trick to making a "perfect" 1/4" inner border!! We also discuss how to quilt your creation whether you are hand or machine quilting. This class is best taught over two days in order to cover all the information and get all the sewing done. By the end of the second day, you will have your top completed, and be ready to start quilting it. Finished with "Romantic Hearts Quilt"? Back to "Classes I Teach"